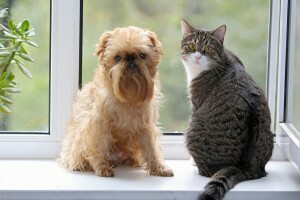 Among the many reasons to own a whole home air purifier is sharing your space with a furry friend. Pets are part of the family, but they often smell like, well, animals. Odors harbored in layers of heavy pet fur, litter boxes or pee pads, or sweat excreted from paws can quickly lend a disagreeable odor to your house. If you’d rather not be the friend with the cat-scented home or the living room that smells like dog, there are two main air-cleaning options you can select from: portable and whole house systems. Prior to purchasing, though, it’s important to understand the limitations and maintenance requirements associated with each type. Portable Air Cleaners: Portable air cleaners are just that – portable. This makes them convenient for areas of the home that require extra assistance, like next to your pet’s crate, litter box, or beside his/her favorite couch to lounge on. However, portable air filters fail to remove airborne contaminants in other areas of the home, can often be noisy, and require regular cleaning and filter changes. Plus, some tend to be quite clunky and heavy, rendering them less portable and convenient. Whole Home Air Cleaners: Whole home air cleaners involve a greater upfront cost than their portable counterparts, but supply many benefits pet owners are sure to appreciate. This type of system eliminates airborne contaminants throughout the entire home, works silently, and is installed into ductwork rather than placed on the floor, so pets have more space to romp around. Many whole home air cleaners require regular filter changes that can prove messy, but purifying options that utilize Ultraviolet light technology to clean and sterilize air only require periodic lamp changes. If you’re interested in a long-term solution to those unpleasant pet odors in your home, RainSoft can be of assistance. Our AirMaster Ultra whole home air purifier with Ultraviolet light technology improves upon traditional air cleaners by sterilizing or killing most contaminants rather than simply collecting them in a filter, and effectively neutralizes problem odors by passing air through a specially designed Ozone lamp. With minimal maintenance and no dirty filters to change, choosing the AirMaster Ultra is an effortless way to oust the “pet smell” from your home for good. Contact your local authorized RainSoft dealer today to receive a complimentary in-home consultation.